"low score and problematic management"
10Bet had been listed as a Casinomeister Accredited Casino from April 2012 until December 2016. At first, they seemed somewhat promising, but they quickly lost interest with being listed at Casinomeister. We had issues with their casino rep being vacant from the Casinomeister forum, they had a very low score mainly due to their slow payouts, and minimal withdrawal limits (which could be waived for our players – meh). 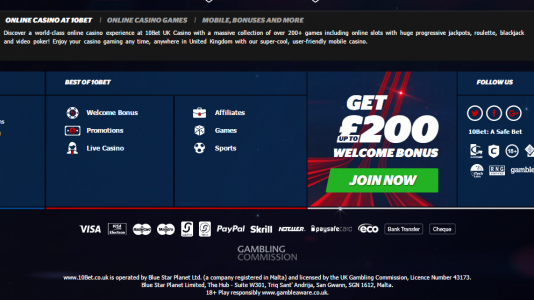 They also have implemented retroactive terms and conditions to their affiliate program, which violates our standards for Casinomeister accredited casinos. Applying predatory terms against their advertisers is unethical and reflects on the general business ethics of this company. Advertisers required to send them traffic – if they don’t, then the casino’s affiliate program will decrease the revenue share of the advertiser. This has been applied to all affiliates whether or not the affiliate signed up under older fairer terms. This is bad business practice and exploitative. If they treat their business partners like crap, how do you think they will treat their players. 10Bet lacked dedication to the site. They weren’t moved at all to being listed as an Accredited Casino, and were rather poorly run. They were consistently scored in the 6 range (a grade of D), and had issues about maintaining a forum presence. They originally came on board in April 2012, and during the time they were listed here they generated six formal complaints (PABs), and unfortunately there were a far number of dissatisfied customers in the forum as well. With their low score, problematic management, and lack of interest in being listed as an Accredited Casino – they were deemed “not a good match” with Casinomeister and were dropped from the list in December 2016. Then they decided to apply retroactive predatory terms to their affiliate partners which is highly unethical. Avoid this casino like the plague.